As a favorite Caribbean destination for generations, Jamaica will always stand out from the crowd. It’s incredible versatile, welcomingly tropical and checks every box on the list for a perfect vacation. The main areas of interest are Montego Bay, Negril, and Ocho Rios. Each one has a unique feeling to it with different excursions available. The landscape of this island is splendid. Sunlight shining on the St. Ann’s Mountains bounces off the palm trees to get washed down the waterfalls onto the white sand beaches we know and love. Any wonder, day dream or ambition can be found once you’re on the One Love Island. 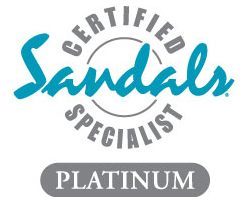 Lisa Hoppe has been honored as a Top 50 Jamaica Specialist so let her agency plan your dream trip to sunny Jamaica.